I was in the mood for something spicy this morning (June 2013), so I decided to finally try this recipe from 'DixieChick' that was submitted way back in 2005. The user comments below are spot on. 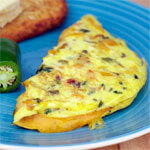 This is a great omelet. I did adjust it slightly to make a single serving. I used 2 eggs, 1/2 of a jalapeno and about 1/3 of single orange bell pepper. I particularly liked the flavor of the cilantro and the double dose of heat from the jalapeno and the Tabasco. Starting the day with a little fire wakes up the senses. Melt butter in a large, heavy frying pan. Add jalapeno peppers, green peppers, red peppers and onions and saute until onions become transparent. Season with salt, pepper, Tabasco and cilantro. Beat eggs with 1 Tablespoon of water and slowly pour throughout the sauteed mixture. Simmer covered over low heat until the eggs are set. Add cheese to one side and carefully flip the other side over. Remove from heat and cover for an additional minute to melt the cheese completely. Fresh and spicy. If you want it mouth-burning hot, don't core the jalapeno. The seeds are the hottest part. 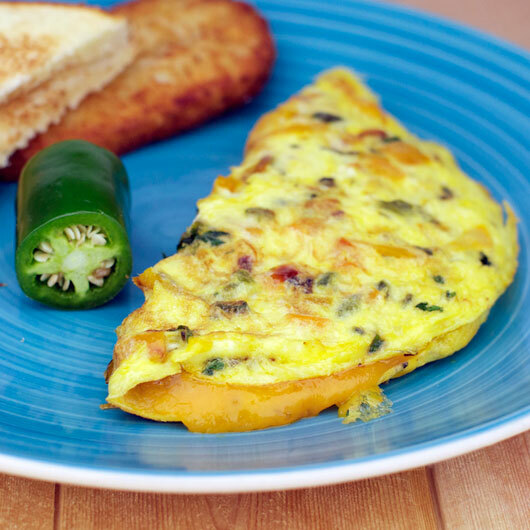 What do you think of Jalapeno Omelet? 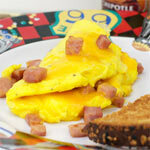 I have never made this particular omelet, but I would never put water in an omelet. 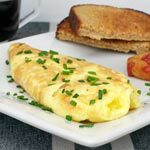 I prefer using milk instead; it makes for a better tasting omelet. For the real spicy guys, use Madame Jeanette Peppers instead of the Jalapeno. I love it! Add spicy sausage and make it extra hot! I added farm fresh sausage. DELICIOUS! Very good, made a few changes by adding chopped tomato and a bit of chorizo. Tasty. I like adding some mushrooms too. Added green, red and yellow peppers with the jolly's. Best omelette I have made yet! Very Yummy! Delicious! Yummy! I've eaten it 5 mornings in a row now. Best omelet ever! Spicy. It almost made my head explode. Delicious! Here's what I did: fry up some mexican chorizo (or you could use spicy breakfast sausage) and crumble it as it cooks. 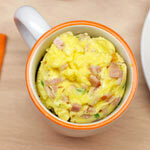 Add it to the omelet when you add the cheese. I like a lot of heat, so it was super good. 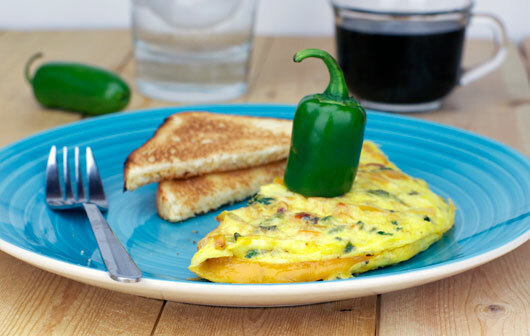 Jalepenos in an omelette was bit intimidating, however this recipe has a great flavor to it. If you take out the seeds and the membrane it just leaves a nice mild heat, if you like it hot leave it in there. Serve this up with a piece of toast and a glass of mammosa and you got yourself an elegant breakfast. It was nice I added green and yellow peppers along with salsa, and gouda cheese. This was the first time I ever made an omelet. I really liked it, but I added mushrooms just because I love mushrooms. Good, but one mistake. The seeds are not the hottest part of the pepper, it's acually the membrane of the pepper. 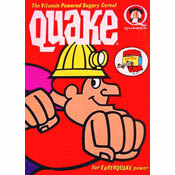 People need to try something new who says theres only sweet food for breakfast.